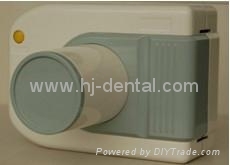 The device is DC high frequency portable dental X-ray unit, small, light and nearly no radiations. 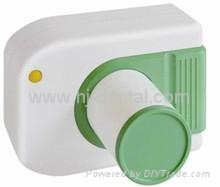 There are manual buttons installed on the surface of shell, operate easily. All of the components are installed in the central PC board, insulation vacuum and sealed sterotype protection make its brilliant features. The unit mainly suitable for oral pre-treatment diagnosis of internal organization structure and root depth and so on, is indispensable in daily life clinec, especially for dental implant surgery. The battery is durability, it can take about five hundred images after full charged, and it can be charged discharged for one thousand times in its life. 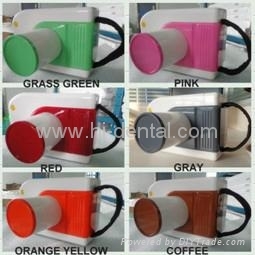 It can be connected with intra-oral digital X-ray imaging system.